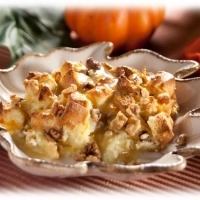 Comfort food never tasted so good try our delicious Orange Walnut Bread Pudding. Your friends and family will be happy you did. Combine 2 cups half and half, eggs and egg yolks, sugar, walnuts and orange zest. Cut baked rolls into ½ to 1 inch pieces and gently fold into mixture. Pour into 8x8 inch sprayed pan. Bake at 350º 45-50 minutes or until knife comes out clean and top is a deep golden brown. Make a glaze sauce combining powdered sugar, orange juice, butter and ¼ cup half and half in a small sauce pan. Warm through until butter is melted. Like rhodesbread's recipes? Never miss an upload!